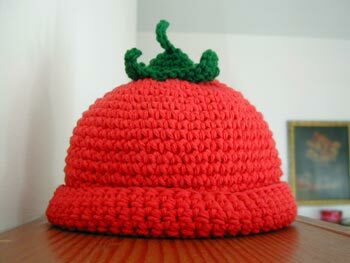 Deb crocheted and sent this sweet little tomato hat for the baby. I received it some time ago, but hadn’t yet had time to share it due to my tech woes as well as all of my mommy duties. :-) Now that I’m beginning to catch up, I wanted to shout out a thank you to Deb! What a cute little hat! So glad you’re back online, I really enjoy your blog. How cute is that hat! What a perfect gift for your new “little tomato”! That made me laugh out loud! Very cute indeed. In fact, I want one. Hi, Love the crocheted tomato hat. Would you allow me to use the picture on my site?